How i can get the mod? To install mod just simply unpack .rar file content to game directory and override all files. How to connect with your friends. 2. Click "Demon multiplayer" button in the upper corner. 5a. As host just leave port alone. Disable 'Use NAT' if you creating server on public ip address. So, for hamachi leave enabled. 5b. As client enter target ip address with port. 6. Click host button or connect button. 7. If you ready (as host) click start game button. I can't connect with my friends. This is a very common problem and I can not always help you with this. Today, as you know, the game hosts one of the players, and the problem is that not everyone can host this game. System Firewall is turned off. If you are using hamachi enable NAT options if you do not use NAT off. If the status on the hamachi is not green, this means a problem with the application. Make sure that the port that uses the game <26656> is added to the exceptions. More really I can not tell you, already tested more than once with my friends and everything works normally. Not everyone can host, so keep that in mind. What kind of things are not yet modified. Chests, cooking station, water purifier, croppot, tree croppot are not synchronized. Will there be a version of the modifications released on mac? No. I have no way to do it :/ Modyfication will be developed only for Windows. Im so sorry for other system users. How can I send a file output_log.txt? Here: http://pastebin.com/ and just give me link. Where is the file located output_log.txt? 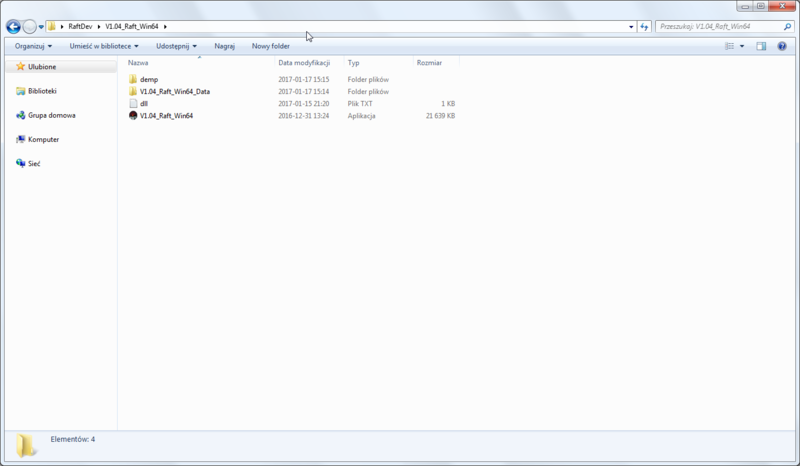 It is located in the folder Vx.xx_Raft_Winxx. For example V1.05 Raft_Win64.